Spiced beef tongue with salsa verde and sharp cheddar rolled up in corn tortillas, covered with more cheese, crema, and salsa verde. Getting dinner on the table when the family has been away from home all day long can be a family affair. [The dogs are not real helpful in this instance. Keeping squirrels on their toes in the back yard? They're on it.] Usually I'm the one with the dinner plan, and I call in the troops for reinforcement when I need help. We like music while we work, so my spouse set up speakers in the kitchen that chat wirelessly with our computer. I wouldn't be surprised to learn that the speakers are sick of my son putting his ear worms on continual play, or want to play something perkier at night when my spouse listens to his classical jams, but I like to mix it up. After iTunes debuted their Radio component [and made it much more difficult to just play what I felt like listening to from my music collection] I discovered the Norteño radio station. What is Norteño? I haven't wikipedia'd it, but I would say you take the instruments from a German polka band and hand them to a group of Mexican musicians, stand back, and listen to the magic happen. I enjoy making dinner and dancing in the kitchen listening to Norteño, and it puts me in the mood to use a traditional meat, beef tongue, in my own way. I'm all about using the whole Swiss chard and the whole cow, so here's another recipe using some of the parts we get when we buy a quarter cow. For another beef tongue recipe, please see my Beef Tongue Nachos recipe. Got ground beef? I've got 106 food blogger recipes using ground beef in my round up here. One of these days the Visual Recipe Index will have a category for Ground Beef and another for Beef Bits and Bobs, though that's not really search engine friendly. I'll probably throw a Pinterest board for all the random beef parts recipes on my Pinterest page. My darling daughter just suggested I call it Beef Undesirables, but I don't think she gets the idea of making it appealing. 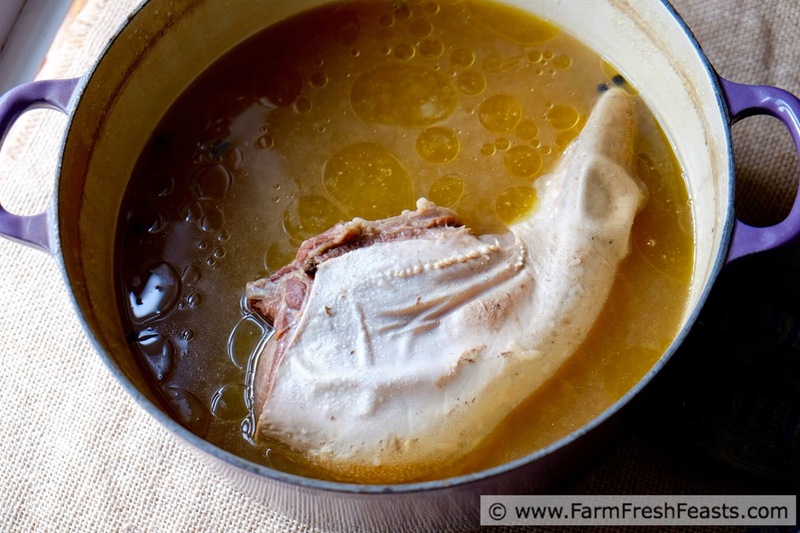 Note: This recipe starts with already prepared beef tongue. I'll send you over to Elise at Simply Recipes because I followed her clear and simple instructions. 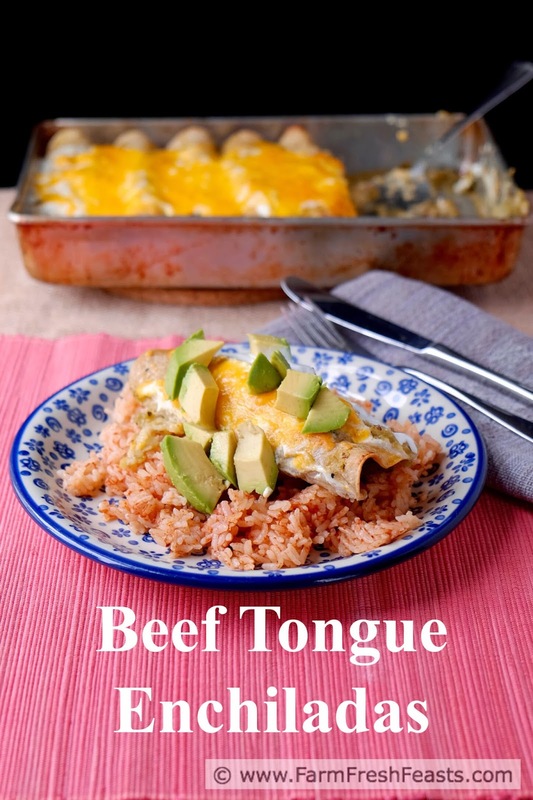 One beef tongue makes a lot of meat for our family, more than just a set of tacos, so I used leftovers in enchiladas. Preheat oven to 350 degrees. If you need to cook the tortillas, preheat a large skillet over high heat, then cook the tortillas according to package directions and wrap in a towel to steam/keep warm until you're ready to use them. 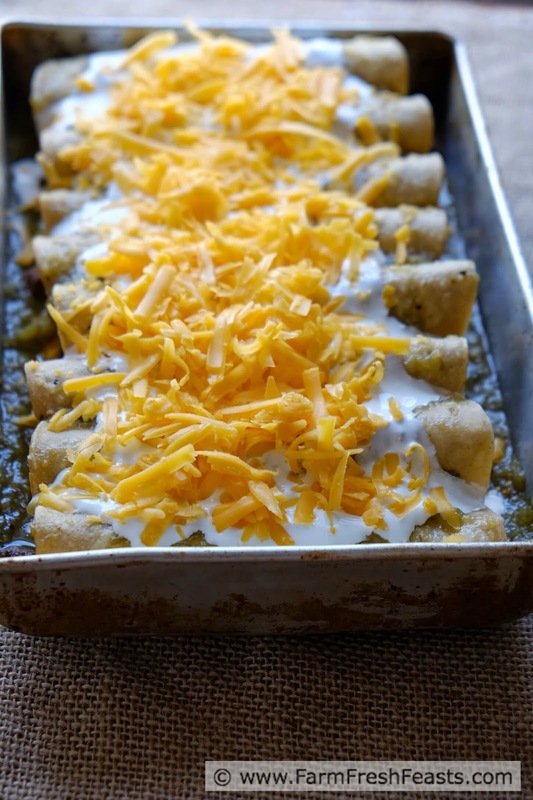 In a small rectangular pan (my 7x11 inch one was perfect family size) spread ½ cup salsa verde. Have all the ingredients (and some willing hands) ready before you assemble, and this comes together quickly. [Even if the Director of Photography makes you turn your wrist just so while placing cheese on the meat.] Pick up a tortilla in one hand, and spread a teaspoon or so of salsa verde down the center of it, and top with about ¼ cup of chopped meat. 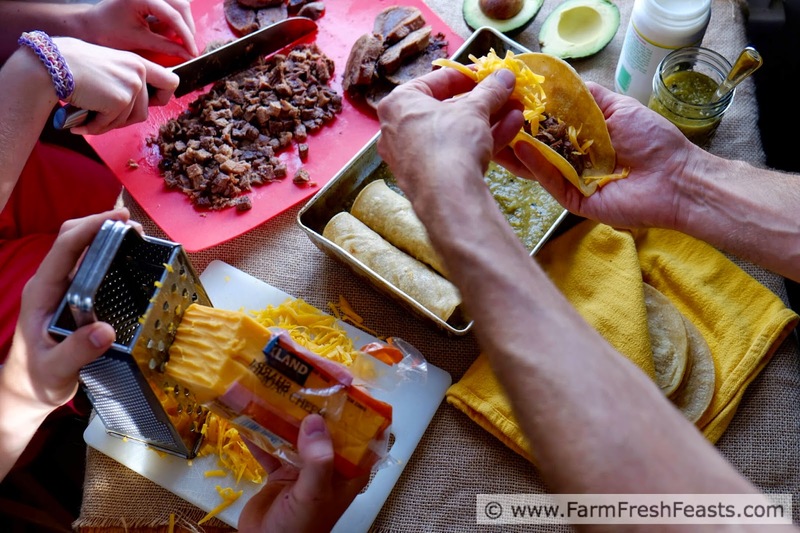 Snag a healthy pinch (up to ¼ cup) of shredded cheese, roll it up, and place seam side down in prepared pan. Continue until you magically run out of meat+tortillas simultaneously. Spread the rest of the salsa verde across the top of the tortillas (this keeps the edges from burning). Pour crema across the top of the tortillas, then top with remaining cheese. Bake for 25 minutes until cheese is melted and middles are heated through. Top with chopped avocados, and serve with additional crema and salsa verde. A Cheater Margarita Smoothie would go nicely with this. It's that whole opposable thumb thing rearing it's ugly head. This looks delicious! I have only eaten tongue once or twice but I'm such a fan of using the whole animal I have to try this! I'm blown away by the flavors of lesser-known parts. Perhaps it's part of a campaign to hoard them all for ourselves? I have only seen beef tongue on the food network but at least I know how to cook it now :) Great use of all the animal! It's not a common sight in the store, that's true. 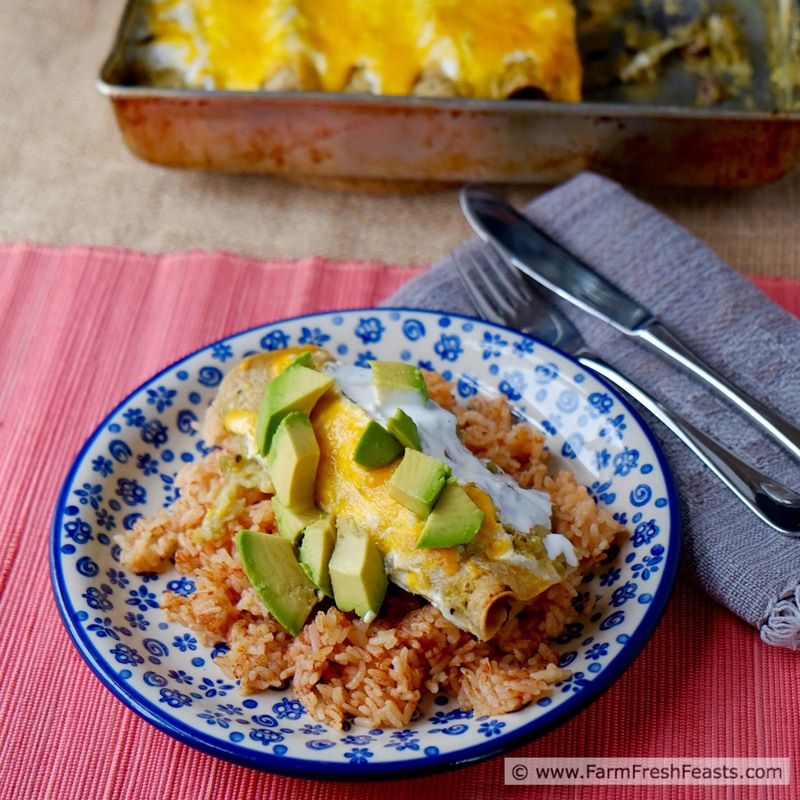 Enchiladas are a great solution for using unusual meat cuts! Filing this one away for the next time I need it! 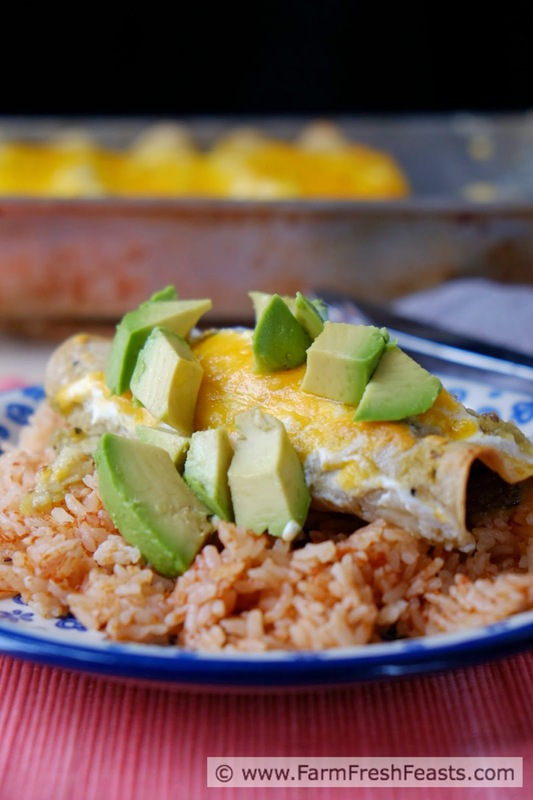 I think enchiladas are a terrific solution in general. Last night I thawed a package of grilled vegetables (put up during the peak of harvest when we had more eggplant than I knew what to do with) and used them as the filling for enchiladas. Yum! I have to admit I'm a little scared of the tongue, but I've heard it's amazing! 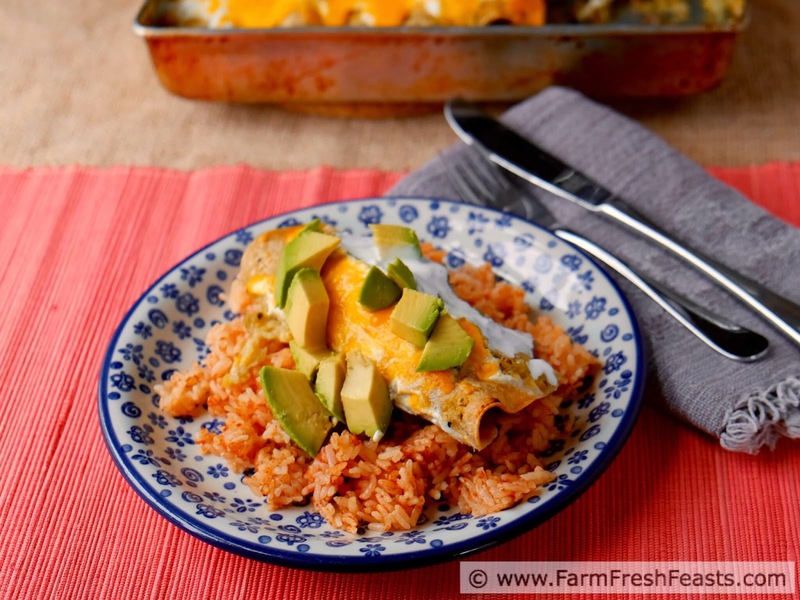 And enchiladas are a family favorite! I think tongue is a good gateway meat. I've mastered it, and now I've got a beef heart in my freezer that I'm cautiously optimistic I can do something with. But only cautiously optimistic, as it remains staring at me every time I get ice for a DIY Iced Chai. I always enjoy tongue in Mexican cooking which is the only way I've ever had it. Always delicious. I've definitely never tried to cook it on my own before, but I like a good adventure. Nice idea. I am always up for a good adventure. It's served me well in life. Crema, what is Crema??? Do I but it, make it or substitute for it??? Crema is similar to sour cream. You can see it in the 2nd photo, upper right corner between the avocado and the jar of salsa verde. I buy it in the grocery store. If your grocery store has a refrigerated International section it will be there. Otherwise, plain sour cream in the dairy aisle will work just fine.